As seen on TV during broadcasts of major sporting events on ESPN and Fox Sports, FanDuel is now offering the FanDuel 5 Pack to all new customers – which provides 5 free contest entries into real money cash contests! You will receive one free entry into the Beginner NFL 50/50 contest each week for 5 weeks! You must make a deposit to receive your free entries. You can enter any FanDuel promo code you like, or don’t enter any promo code at all, they all give you the same welcome bonus! 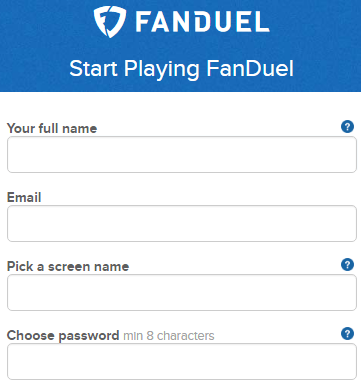 Click here to sign up to FanDuel! If you haven’t yet registered, navigate to fanduel.com. Then click on the green “Start Now” button. A registration form such as the one below will appear. Fill in your full name, your email address, a screenname of your choice and a password. FanDuel does not request password confirmation at this point, so take care to enter it correctly. The registration form may give you an option for a promo code, it does not matter what you enter in the promo code field as all new customers qualify for the same welcome bonus. To receive your five free entries, you will have to make a deposit. Once you make a deposit, you have 35 days to use your 5 entries so get started immediately! All new customers will automatically receive the 5 Pack Promo, providing 1 free entry per week, for 5 weeks! The entries are good for real money cash contests. The contests are beginner NFL contests, so you will only be playing against other beginners new to FanDuel. The contests are 50/50 contests, which means that half the field wins and doubles the buy-in. Since there is no buy-in, the amount you actually win is determined by the amount of your initial deposit. The total value is worth up to $50! 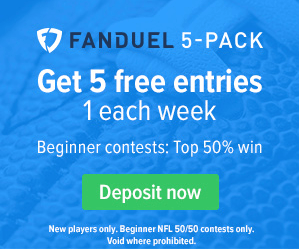 After you make your initial deposit, Fanduel will email you once per week for five weeks, and each email will have the link to gain access to your free Beginner NFL 50/50 contest. The minimum deposit at FanDuel is $10. If a particular deposit method has a method-specific minimum higher than $10, then that higher amount would take precedence. FanDuel accepts all major credit cards and debit cards, including those backed by American Express, Discover, MasterCard and Visa. Although FanDuel caters to the North American customer, it does accept some Europe-centric cards, such as Visa Electron, which is part of the Visa Family, and Maestro, which is part of the MasterCard Family. Gift, prepaid and reloadable cards backed by the above companies are also accepted, but you should make sure to hold on to that card because FanDuel will want to use this method when you make a withdrawal. 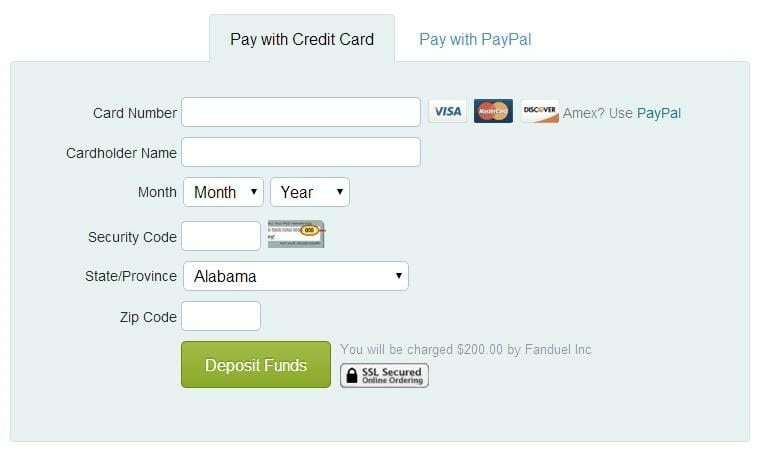 FanDuel also accepts PayPal, and it does not currently accept wire transfers and the like. As of this review, FanDuel supports football (NFL and NCAA), baseball (MLB), hockey (NHL) and basketball (NBA and NCAA). Many of the leagues on FanDuel are daily leagues that run for just a single day, but you can find leagues that go on for longer periods, including entire seasons. So you’ve registered at FanDuel, and made your initial deposit. What’s next? Let’s say you’re a football fan. Log in to FanDuel and click on either the NFL or CFB icon, which will be located in a vertical menu to the left or in a horizontal menu up top depending on your browser orientation. Next, choose between “Tournaments,” “Leagues,” “Head to Heads” and “50/50s & Multipliers” by selecting the appropriate header. If you’re unsure of what type to play, choose Leagues. FanDuel will now present you with a list of available leagues, and you can search this list or sort by a number of characteristics, including size, entry count, entry fee, prize pool and start time. Once you’ve found a league that suits you, click the green “Enter” button to begin. Click here for detailed instructions on how to play fantasy football! FanDuel leagues use a salary structure, which means that you’ll have x dollars available to complete a roster. Each player will have a dollar value assigned to him by the system based on the league settings for scoring. Your goal at this point is to field a legal team while making the best use of your available resources. Most leagues allow you to drop and add players as the season progress along as you remain within the salary cap. It’s often easy to pick starters who’ll produce, but these leagues are often won with production generated from players who are undervalued on any given Sunday. Sound like fun? Sign up to FanDuel today! FanDuel is good, but DraftKings is better for fantasy sports! Read our DraftKings review here.